Nuffield Health Tunbridge Wells Hospital offers a wide variety of children’s services, including day case surgery, pre-assessment appointments, overnight stays where required and paediatric outpatient consultations. How can our paediatric consultants in Kent help your child? Our outpatient services consist of radiology services (CT, MRI, ultrasound scanning and X-rays), blood tests, minor operations and paediatric physiotherapy sessions. Our paediatric consultants, surgeons, anaesthetists, nurses and physiotherapists are extremely experienced in caring for children. Outpatient clinics: Newborn - 16 years. What speciality surgery do we offer? Common paediatric clinics include allergies, asthma, constipation, enuresis (bed wetting), behavioural issues and blood tests. We are able to offer operations that may not be available on the NHS (coablation tonsillectomy, pinnaplasty and reconstructive surgery). Our six bedded children’s day case unit is secure and has en-suite child friendly rooms for elective admissions. How do I book a treatment for my child or teenager? Your GP can refer your child, you can use medical insurance, self-fund or pay via a medical loan. Our hospital patients feel better faster thanks to zero waiting lists. Unfortunately we are unable to accept emergency admissions. If there is an area of child health that you’d like to know more about, please contact our paediatric experts on 01892 552932. "I have been at Nuffield Tunbridge Wells Hospital since March 2017. Prior to this I was a paediatric sister at Tunbridge Wells Trust." "The position at Nuffield Health is a new and exciting challenge. A major advantage is that I already knew most of the consultants and staff from my previous role at Tunbridge Wells Hospital." "I trained at Great Ormond Street Hospital in 2002. When I qualified I worked at University College Hospital London for two years on a variety of paediatric wards including general medical, surgical and oncology. I then worked at Kent and Sussex and Pembury Hospital as paediatric staff nurse." 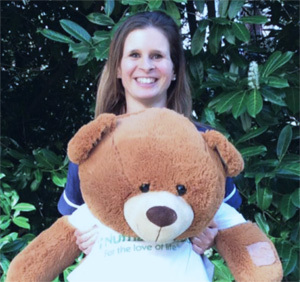 "With the move to new Tunbridge Wells Hospital Trust I was appointed as a paediatric sister. I’ve also had paediatric community experience whilst on secondment in the last year." Why did you decided to work with children and young people? I have always enjoyed working with children. I wanted to help children and their families and make a difference. Nursing runs in my family my Mum is a nurse too! The work of a nurse is very varied. Every day is different and it certainly never gets boring. If we have children for surgery they arrive at 07:30 and the theatre list starts around 09:00. Most of the day case patients have gone home by 19:00. Some days I will spend the day pre-assessing children prior to theatre and assisting in outpatients clinics. Other days I’m busy attending meetings, networking with other Nuffield sites and liaising with their children and young person’s departments. What kind of paediatric cases do you deal with? A variety of surgeries. Ear nose and throat, urology, orthopaedic, gastroenterology, plastic and reconstructive surgery and dermatology. Have you seen many changes to this field since you began? Yes, nursing evolves all the time and is a constantly changing environment. For example Nuffield Tunbridge Wells Hospital now offers Coblation Tonsillectomy and Pinnaplasty. Treatments which are not currently offered on the NHS. Making a difference to the child and their family, improving their quality of life and giving them the best possible experience from admission to discharge. The team get amazing feedback from both children and their parents. This makes it a very rewarding and worthwhile job. Children are fun to work with, make you laugh and always tell the truth!